This morning fellow VFP member Will Griffin and I had the pleasure to meet with four members of the Korean VFP chapter. 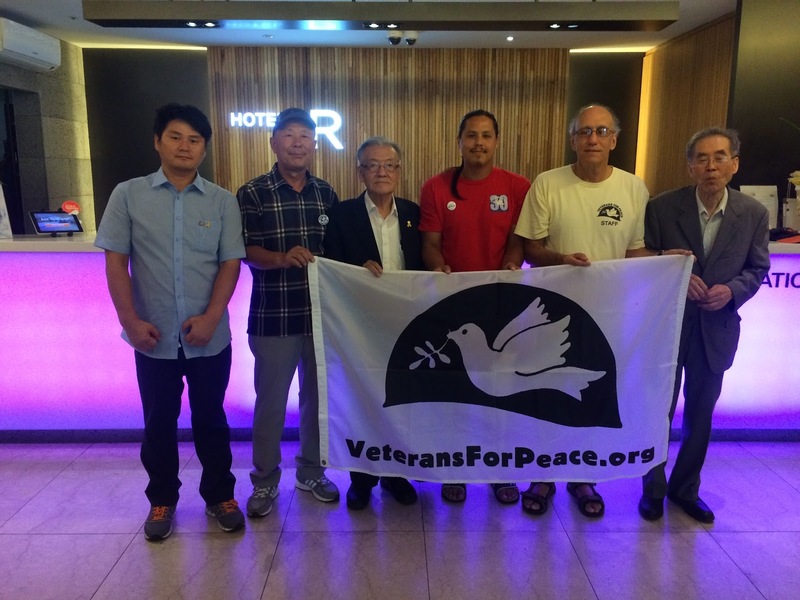 On previous trips to South Korea I've met with the Korean chapter and once brought them the US VFP flag given to me by Tom Sturtevant who was a Korean War veteran in the Maine chapter. Tom insisted that I be sure to deliver the flag to them, which I did. Since Tom's passing a few years ago our Maine VFP chapter has been re-named in his honor. Two of the Korean VFP members we met with today were Captains in the South Korean Army. One was a tank commander and the other taught PsyOps at the Army Academy. During our discussion they made a strong statement about their concerns over the growing US-Japan-South Korea military alliance. They told Will and I that they have long experience having lived under the occupation of the imperial Japanese fascist occupation and worry that the American people are far to ignorant of this history. I suggested they might consider writing an article about the dangers of this new military alliance the US is creating in the Asia-Pacific region. I promised them I'd be sure to get it printed in the excellent newspaper produced by VFP called Peace in Our Times. They were eager to do this and promised to send me the article soon. Following our meeting they took Will and I to lunch at a wonderful Asian buffet restaurant. I had met with two of these men in the past and I immediately felt close to them upon meeting them again today. They are going to try to arrange another meeting, maybe a protest together, before Will and I conclude our visit to South Korea. Release the Jailed Progressive Activists in South Korea! 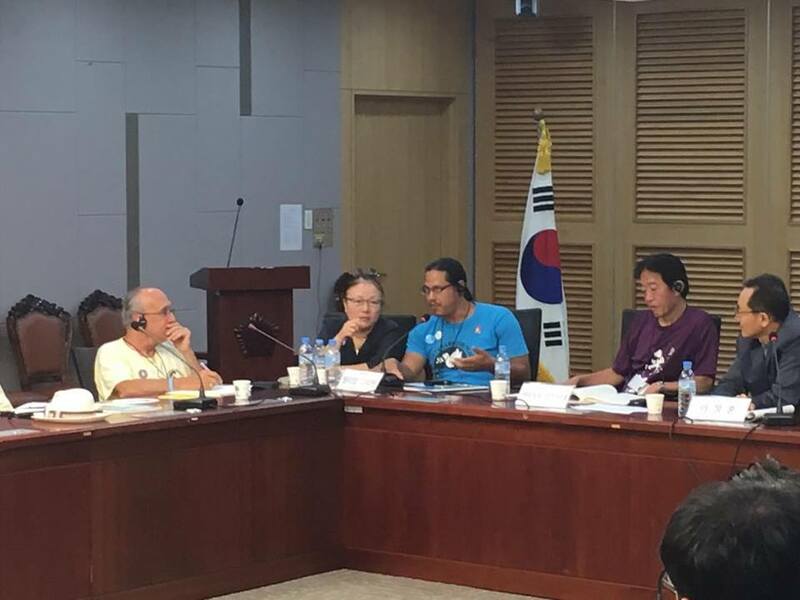 Former UPP political prisoner Han Dong-geun (2nd from right) spent two years in South Korea prison for wanting the reunification of Korea and an end to war conditions between the north and south. He was one of 10 UPP members jailed by the government in an anti-communist witch hunt. Will Griffin and I today had a very instructive and moving meeting with two members of the international support team of the Korean Committee to Save Rep. Lee Seok-ki. One of those who met with us was Han Dong-geun, who himself was released from prison last year after a two-year sentence. A South Korean court sentenced Seok-ki, a left-wing lawmaker, to 12 years in prison and nine colleagues to shorter terms for allegedly plotting a "pro-North Korea rebellion in the event of a war on the Korean Peninsula". Prosecutors also asked judges to strip United Progressive Party (UPP) Member of Parliament Lee Seok-ki of his civic rights for 10 years following his eventual release from prison. The UPP was a small party with only six seats in the National Assembly. Lee Seok-ki has described himself as the victim of a “witch hunt” by South Korea’s spy agency, the National Intelligence Service (NIS). Many believe the NIS used the show trial to distract the public from overwhelming evidence that the intelligence agency interfered in the last national election in favor of right-wing President Park Geun-hye's "successful" campaign. President Park is the daughter of former brutal dictator Park Chung-hee. During Park’s iron-fisted rule from 1961 to 1979, dissidents were tortured and sometimes executed on charges of "plotting" against South Korea. 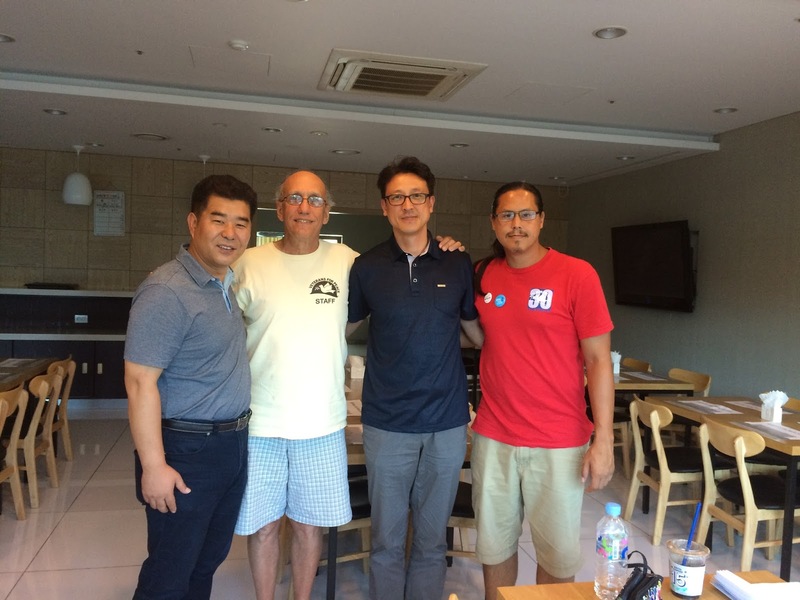 While on previous trips to South Korea I met several older activists who spent as many as 20-25 years in prison for opposing the first Park dictatorship. Both the past and present Park regimes in Seoul were and still are obvious US puppets. More than 100,000 South Koreans belonged to the UPP before it was banned following the jailing of Seok-ki and the other party members. After appealing their sentences to the Korean Supreme Court the charges of "insurrection" were dropped but lesser charges remained that are keeping the activists in prison. The Supreme Court agreed that the UPP members were not engaged in any violent overthrow of the government. The initial charges all stemmed from a 90-minute lecture by Seok-ki three years ago entitled "How to achieve peace on the Korean peninsula". A spy within the UPP, who had befriended Han Dong-geun 20 years before, taped the speech which the government used as 'evidence' during the trial of the party members who were ultimately jailed. The NIS manipulated the tape recording by taking out some words and inserting 700 new words in order to make the governments case against the UPP. Eventually the NIS had to admit they had monkeyed with the tape. Religious leaders from five leading denominations throughout South Korea came to the defense of the jailed UPP leaders and the Jimmy Carter Center called for their release. International solidarity is required to help relieve pressure on the progressive movement in South Korea today. In September the Seok-ki support committee will do a tour of North America making stops in Chicago, New York, Toronto and other major cities. During his time in prison Han Dong-geun was confined to a tiny cell for 23 hours a day, only able to see the sun for one hour. But he told us he didn't feel isolated because of the strong support he received from supporters on the outside. At the end of our meeting I said that I've long felt South Korean activists are currently experiencing the kind of repressive treatment that activists in the US will be facing in the coming years. I remarked that I believe American activists should be paying attention to, and learning from, the current struggles of our Korean friends as they fight back to protect their democratic and human rights that are steadily being taken from them. The National Security Law says it is illegal to call for US military bases in South Korea to be closed or to call for the reunification of Korea. It is also illegal to say that you want North and South Korea to "make a peace agreement" because that is the same position that the government in the North takes. The Korean War is officially not over - there was only an Armistice signed but the US is the one that refuses still to this day to negotiate a full peace treaty with North Korea. I think the reason is obvious. As long as no peace treaty exists the US can justify its massive military presence in Korea which in the end is aimed at China and Russia as much, if not more, than aimed at North Korea. There is no doubt in my mind that South Korean progressives would not be jailed unless the US government wanted the puppet regime in Seoul to do so. Can we in America not understand that some day very soon this same treatment will fall on our shoulders as well? Now is the time to speak out and resist this growing corporate fascism that is gripping the entire world. Han Dong-geun handed Will and I a booklet entitled, "As he is not free, I am not free." Those words pretty much sum it all up in a nutshell. Yesterday Will Griffin and I were taken north to the DMZ (Demilitarized Zone) between North and South Korea. 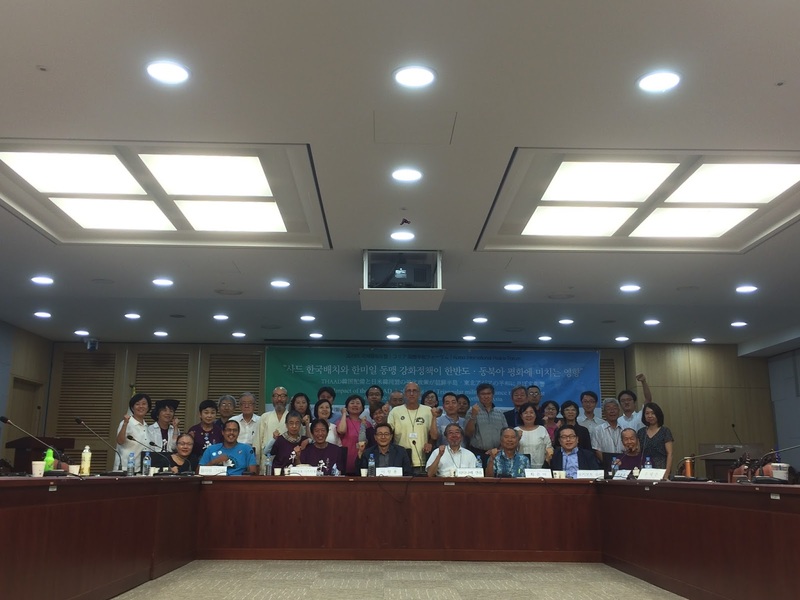 We were joined by several South Korean activists who specialize in Imjin River protection and landmines. My son Julian and his friend Emily (both also visiting South Korea) joined us for the day as well. We began by going to the overlook area between North and South where the Imjin River helps create a natural barrier between the two nations. Then we moved to another part of the DMZ where we walked down a tunnel (one of four) that North Korea created to allegedly infiltrate the south. This tunnel gradually sloped downward eventually equaling 24 stories below the ground. What began as an extremely hot place soon got colder and colder as we headed downward. Coming back up was quite a challenge. I could not help but wonder if the South Korean government's demonization of North Korea for the tunnels, at what is essentially a DMZ tourist trap, might be better explained as a defensive effort on the part of the north to send troops deep into southern territory after a US-South Korea attack on the north. I know that during the Korean War the US bombed every standing target in North Korea and the people, in order to survive, had to move underground. At night they would come outside to tend their farms and then return underground during to day in order to stay safe. It is likely they kept digging tunnels after the war in order to have a way to militarily respond in the event they were ever attacked again. Today 600,000 South Korean military are stationed along the DMZ. About 2,000 US troops are also along the border. These days most US troops are being moved south to get them out of range of North Korean artillery. New bases and expanded bases to the south are now home to more than 25,000 US troops. At those bases the US has high-tech weapons systems that allow them to wage war from a 'safe distance'. 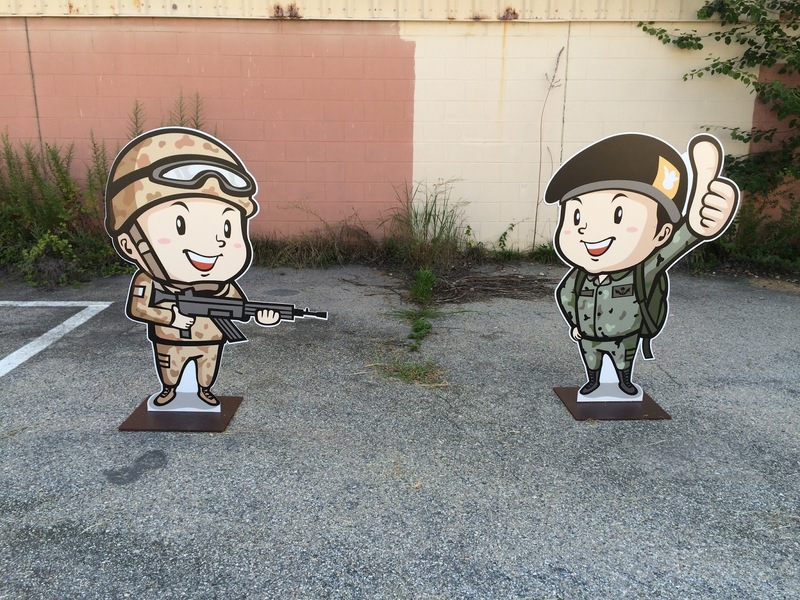 The DMZ tour finally took us to a former US Army outpost called Camp Greaves that has been turned into a 'youth hostel' where tourists are taken to pretend they are in the Army. As our bus arrived in 'Camp Greaves' a young woman dressed in military attire (with a cheer leading skirt) boarded the bus to explain we could go inside air conditioned tents and try on a military jacket, make ourselves dog tags, put on a military back pack, and experience the actual setting for a film about South Korean 'peace keeping missions' around the world that is now popular on TV throughout the Asia-Pacific. In fact the woman later said when we got into the tent, pointing to a chair Will was sitting in, the TV star "sat right here". Will quickly got up and left the tent. 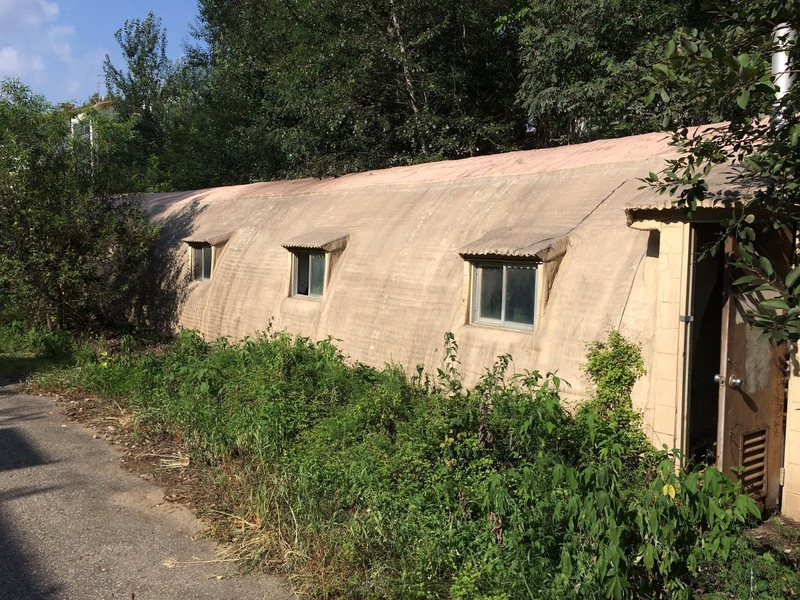 I walked around the base a bit and saw other old barracks being taken over by nature. Soon they will be covered completely and ultimately will collapse under the weight of mother nature. I see this process of nature taking over the base as symbolic of the reality that these US military outposts of empire are contradictions in nature. These bases are not sustainable in time - due to cost, due to pressure inside of South Korea for them to be closed, and due to pressure inside the US for our tax dollars to be used at home for human development and physical infrastructure repair rather than endless war. When we earlier had stood at the DMZ tourist overlook site peering out at the Imjin River into North Korea I asked the two South Korean activists from the area what they were thinking. One of them said he was feeling "A sense of longing to go to North Korea to see for himself what is actually going on there." But under the last two right-wing presidents South Korea has stopped the progress previously made in steps toward reunification. Where once union workers from the South would go play soccer with workers in the North, these days the doors to reestablishing brotherhood have been closed. The current Park administration, more in line with US interests, has escalated tensions and shut down talk of reconciliation. It appears to me that Washington is hell-bent on war against China and Russia. There is a deep sense of fear, despair and disempowerment with many of the people and activists here. Many young people feel they have no future in South Korea as the economic divide between rich and poor widens. People care but don't know what to do. War, and rumors of war, keep the people (whether in South Korea or the US) distracted from fighting against our growing impoverishment by the corporate elites. In the US the circus sideshow 'election' between Clinton and Trump is designed to ensure that the nation does not seriously reflect on these same key issues. It is clear that the globalization of the corporate agenda must be met by the globalization of the peace, social justice and environmental movements. We are all in the same boat now and must face our common enemy together. 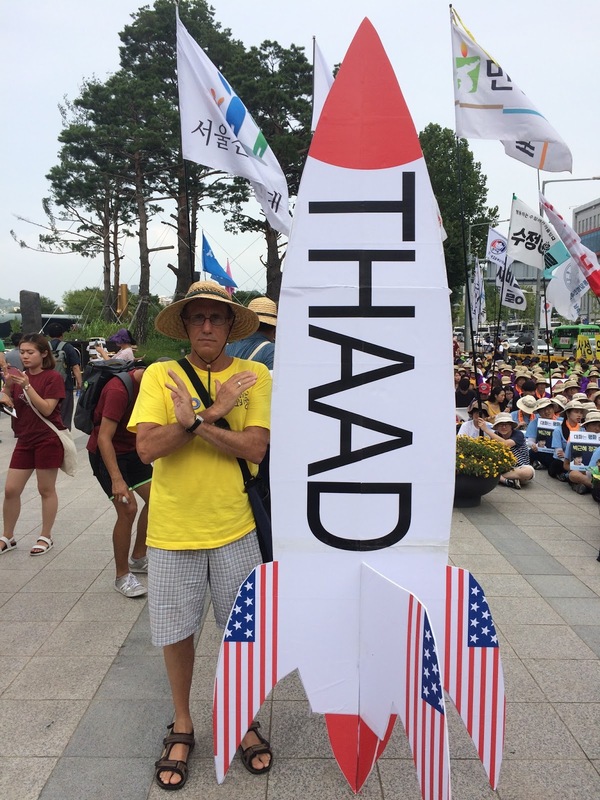 Tomorrow August 14 Sunday, 7 PM Seoul City Hall Square protest the missile defense system THAAD to be placed on the Korean Peninsula by the US. Let's get together! 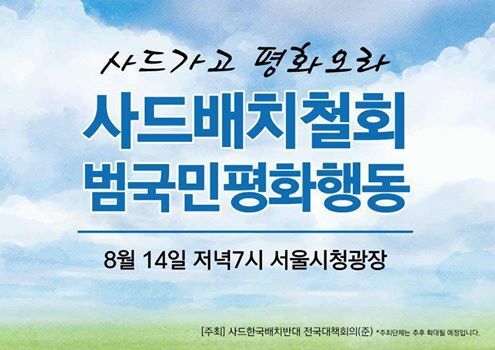 No THAAD rally tomorrow on Aug 14, 7 pm at Seoul City Hall Square. Let's go together! This short video shows two of the four events Will Griffin and I attended yesterday. One was a large peace march in front of the US Yongsan military base in downtown Seoul. The primary issues addressed in the preceding rally and march were continual Pentagon war exercises in Korea, THAAD deployments by the Pentagon and the recent trip by the Navy Vice-Admiral who commands the 'missile defense' (MD) program. The Vice-Admiral came to South Korea and said that the THAAD would not be integrated into the US's MD program but instead would be a stand alone system and would only aimed at North Korea - not China. The US has been telling similar lies about the MD deployments it has made in Turkey, Romania and Poland. In that case the US claims the MD systems in those countries are aimed at Iran not Russia. These are of course total fabrications of the truth. The second thing that the Vice-Admiral said is that the radar's electro-magnetic radiation will not have any health impacts on the local populations. The Pentagon refuses to do any health studies under public scrutiny. I'll always remember the case in Cape Cod, Massachusetts where the people demanded that the state force the Pentagon to do a study about the early warning/MD radar there but the military has refused to do so - why does the Pentagon refuse? Many people on Cape Cod have long maintained that their health has been affected by the radar - particularly they believe an increase in cancers is related to the radar. Following the march in front of Yongsan we moved to a huge rally at the Seoul City Hall where 10,000 people gathered to protest against THAAD deployments in Seongju. I was honored to be able to speak to the audience and at the end of my brief talk I presented our next Keep Space for Peace Week poster to a representative from Seongju. 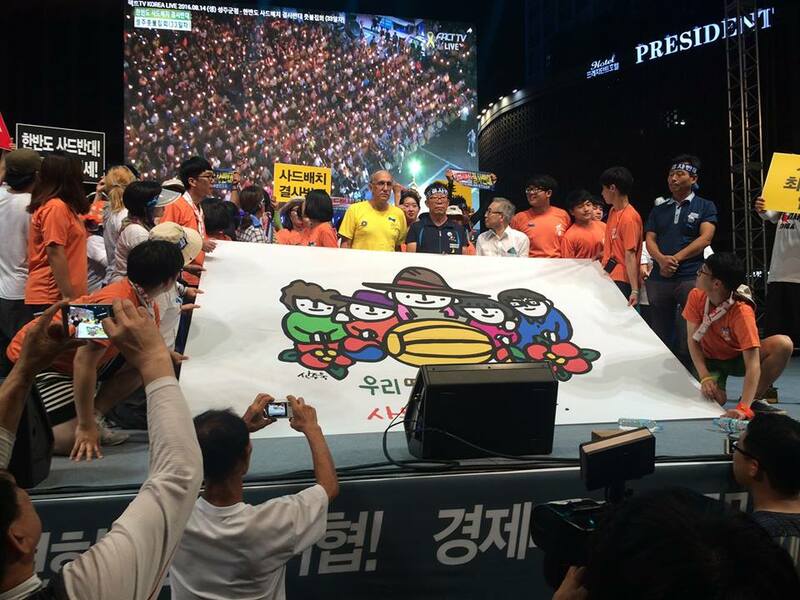 The rally lasted four hours and included many wonderful cultural expressions that the Korean people use to educate and entertain those attending. Today we are back out on the street for another mass march to celebrate Korea's liberation from fascist Japanese colonization. One speaker last night said that Korea suffered terribly under Japanese colonization and now suffers under the American version of colonization. The Korean people don't want to be occupied anymore. They desperately want to reunify all of Korea in a peaceful and just way. Just arrived at the US military base Yongsan in downtown Seoul yesterday for rally and march near the base gates. This THAAD prop was later set on fire by the protesters and the police immediately came and extinguished it which created a toxic cloud that was not fun to breathe. As we marched by the US base a long line of police stood on one side of the road for as far as the eye could see. Some even stood on top of the long rows of police buses parked on the opposite side of the street. I think most of the police were relieved that nothing happened - they are largely drafted for 18 months and get to choose between being in the Army or the police. We were told they prefer the police because they have an easier time but then have to increasingly pull duty going up against protests. One of the leaders from Seongju where the US wants to deploy the THAAD 'missile defense' system at the huge rally last night. The formally conservative community of Seongju voted 85% in favor of the right-wing dictator (President Park, daughter of former brutal dictator) in the last election. Since they learned about THAAD the community of 10,000 has overwhelmingly resigned from the right-wing political party. They now say that THAAD should not be deployed anywhere in South Korea and that the dangers of 'missile defense' must be understood throughout East Asia. 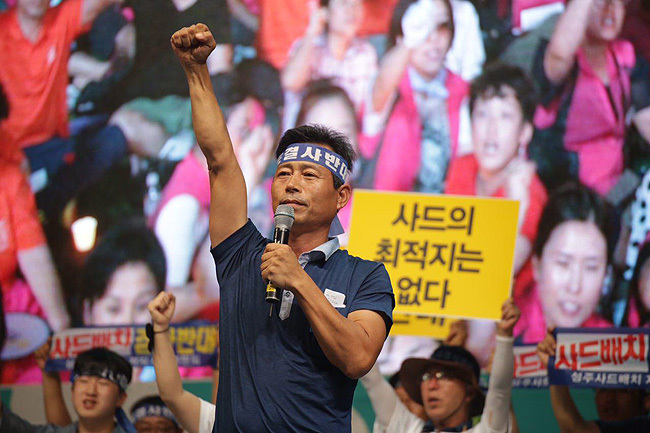 Seongju residents have become heroes to the peace movement in South Korea. Near the end of the rally last night, standing on the stage before the crowd of 10,000 people (here I am next to the leader of the progressive KCTU labor federation) they put on the screen behind us a rally of thousands happening at the same moment in Seongju. We heard a speaker there and then both crowds - in Seoul and Seongu sang the same song together. It is things like this that lead me to repeatedly say that Koreans are the best organizers that I have ever seen. They really know how to put on a show. After attending another rally and march this morning honoring National Liberation Day from Japanese Occupation we marched through the center of Seoul. Then we were taken to the National Assembly building where the Korea International Peace Forum was held. I was proud of Will Griffin from Veterans For Peace who spoke on behalf of our two-person American delegation to an audience of Korean and Japanese activists. A Chinese professor was not allowed into the country nor were our two Korean-American guides/translators from New York City. 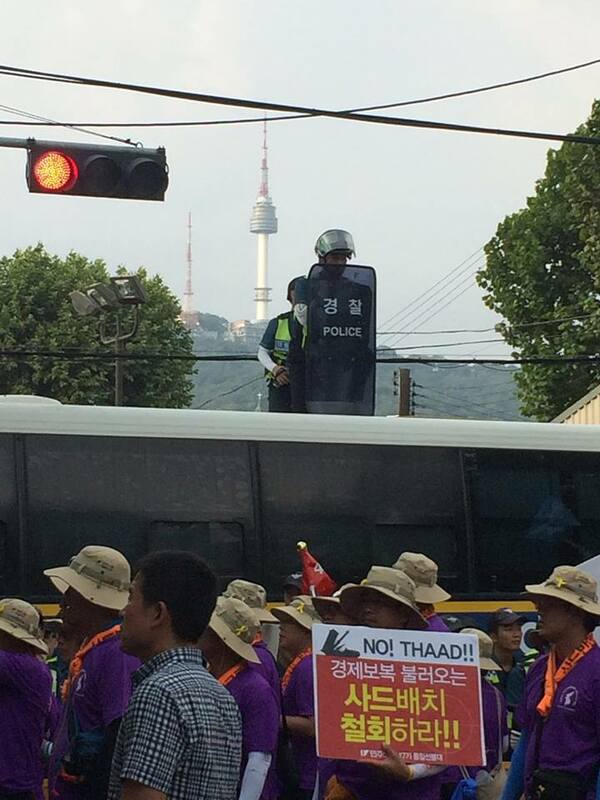 One woman said during the event that "The three being stopped from entry shows how afraid the South Korean government is of growing solidarity with the movement against THAAD." A photo of the international guests and peace forum organizers at the end of the event today. A proposal was made to establish the International Network for Peace in Korea and I pledged to take this initiative to the Global Network to get our organization's support for this new organization. 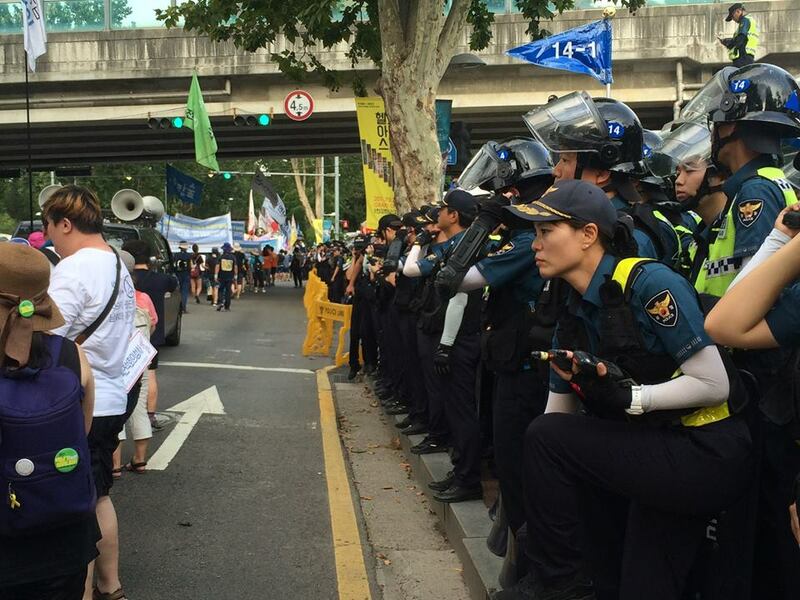 One South Korean organizer said, "We don't really expect anything from the US - we do expect people in East Asia to work together in solidarity to prevent war." It is my hope that activists in the US will quickly learn that since no peace treaty was ever signed after the Korean War Armistice (ceasefire agreement) it means that the Korean peninsula remains a serious trigger for WW III. The US is the one that refuses to sign a peace treaty with North Korea. I believe the reason is fairly simple - as long as the war is officially still on with North Korea then the US can 'justify' its occupation of the peninsula which ultimately is aimed at China and Russia. Han Chung-mok (Standing Representative, Korean Alliance of Progressive Movements) concluded the peace forum today with these words: "Solidarity and unity is the way we have to confront the endless wars of capitalism." Solidarity must be active and on-going to be effective against those suffering under the boot of US military repression and war. The Korean people know suffering deeply as they were ravaged by the US-led assault on their nation during the Korean War. Since 1953 the US military presence in Korea has been nonstop and as we've repeatedly seen on this trip (and previous ones) the Pentagon continues to grab the lands of the Korean people for US base expansion as Washington prepares for war with China and Russia. Korea is on the front-lines of this war preparation and will pay a tremendously heavy price should war break out. Already the Pentagon has put into motion military plans to launch a pre-emptive strike on North Korea that could trigger nuclear war. Will the American people continue to sit on the sidelines and let our country devastate Korea a second time? Will the American people ever move beyond calling for a vague and relatively uncontroversial 'peace' on their protest signs and move into active solidarity which would change the very nature of our protests at home forcing us to spell out the real steps that would being true peace and reunification to the Korean peninsula. Close US Bases in Korea! 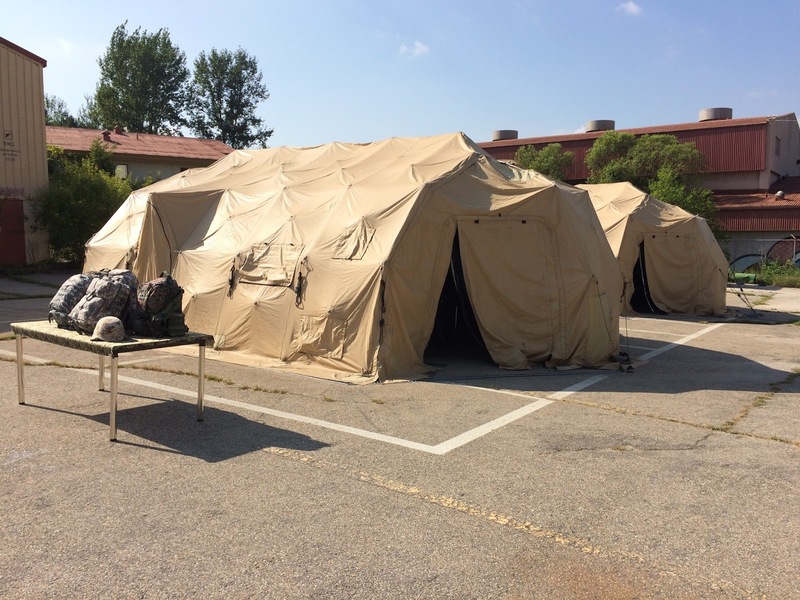 No Anthrax in Seoul and at Osan AFB! Stop US Military Exercises in Korea! No Navy Base on Jeju Island! Sign a Peace Treaty with North Korea! End US Nuclear Hypocrisy - Cancel Obama's $1 Trillion Nuclear Weapons Upgrade Program! The local Seongju TV reports 908 people shaved their heads as an expression of opposition to the THAAD, in a park of Seongju, Kyungsang province of Korea. Remembering the day of August 15, the 71th anniversary day of Korea's independence from Japan, the original plan was to have 815 people. But more than 900 people volunteered for shaving hairs. Not only men but women, too. It is told to be a record that such numbers of people got shaved in a same spot and day. The blue is a symbolic color of anti-THAAD protest in Seongju which has 45,000 population. In Korea to shave your head is an act that indicates total commitment to the struggle. It is also rare that women shave their heads.